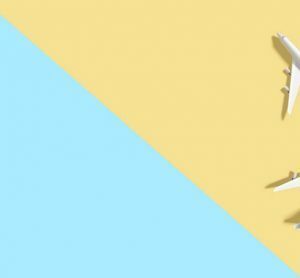 Airports are encountering an increase in threats from terrorist activities, which has resulted in a marked increase in the number of terminal emergency evacuations due to both real events and false alarms. Michael Ferreira, Vice President Development for Aviation & Transportation at Jensen Hughes, provides an overview of new dynamic exit signage technology that aids passenger evacuation in the case of emergency events. The method by which the system of emergency exits in a typical airport is designed is based on the prevailing building and fire codes, which assume a distributed evacuation of passengers using the closest exit during an emergency event. The number of exits, their location, and their exit capacity are based on a set of prescriptive rules designed to minimise the number of passengers using an individual exit as well as the travel distance to each exit. With fire in mind as the determining event, the exit paths are designed so that if one exit is blocked by fire and smoke at least one alternative exit path is available. In order to provide a safe path to exit, emergency lighting is typically required, and a system of illuminated ‘Exit’ signs (in the United States) or ‘Running Man’ signs (international) are provided to mark the path to each exit as well as each exit itself. A bomb threat, explosion, or active shooter event occurring on the landside of the terminal may warrant evacuation of passengers using the tarmac exits only, as well as a desire to prohibit passenger re-entry from the air side to the land side of the terminal. For each of these events, airports would currently have to depend on staff intervention or audible announcements through the airport’s mass notification system or PA system in order to instruct passengers which exits they should and should not use during the event. 2016 saw the occurrence of two of the deadliest terrorist attacks within major international airports, indicating that airports have now become focal points for these types of attacks. The attack at Brussels Airport in Belgium in March 2016 resulted in 11 dead and over 100 wounded as two bombs went off on either side of the airport’s departures hall1 . The attack at Ataturk Airport in Istanbul, Turkey in June 2016 resulted in 41 dead and more than 230 wounded as bombs went off in a car park; the first floor departures hall; and ground level arrivals hall2. Another bomb attack plotted against the Berlin Airport in Germany was foiled when a suspected Syrian IS militant was caught by German police3. Since 2010 there have been at least 25 reported events that necessitated evacuation of at least one full terminal of an airport, which is a significant increase in reported evacuation events over previous decades. The majority of these events were caused by security concerns, including suspicious vehicles or luggage, security breaches, and bomb threats. Two separate events occurred in the U.S. shortly after the bombings in Brussels and Istanbul that involved the terminals being evacuated, due to reports of sounds of shooting that later proved to be unfounded. The first event occurred at JFK Airport in New York on 14 August 20164. The second event occurred at LAX Airport in Los Angeles in September 20165. For both the JFK and LAX incidents, reports of mass confusion, misinformation, chaos, and passenger panic accompanied the events. One particularly damning account of the JFK incident published in New York magazine6 described passenger “stampedes”; “police charging through terminals with guns drawn”; passengers “screaming”; and “utter bedlam”. Despite the journalistic license that may accompany some of these descriptions, there is likely more truth than not in the observation that the airport’s “crowd-control mechanisms had collapsed into total disarray”, as in both the JFK and LAX incidents, passengers had evacuated using tarmac exits without being directed to do so by airport personnel. In addition, airport staff were also reported to be unsure as to the nature of the event taking place and were therefore unable to give accurate guidance to passengers on when and how to evacuate. The evolution of the modern airport has complicated the issue of passenger evacuation during emergency events. The airports of the 1950s, 1960s and 1970s used to consist of fairly sterile spaces, devoted solely to the functions of the airport, with minor amenities for the travelling passenger. Today’s airports are described by some as shopping centres with aircraft parked outside. Airports have greatly increased retail offerings and attractions that enhance the passenger experience. 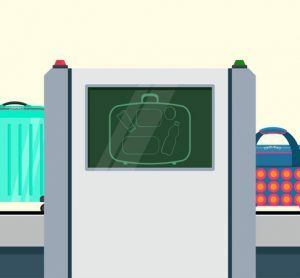 Walking down a concourse in a modern-day airport, passengers will pass kiosks, retail signage, storefronts, and other visual distractions that can cause a typical standard ‘EXIT’ or ‘Running Man’ sign to be difficult to find amongst the visual clutter. The increase in retail offerings can also put strains on the means of egress for an airport terminal, particularly for older terminals being retrofitted with new retail offerings that encroach upon concourses and reduce the widths of circulation paths to the minimum allowed by code. In addition, passenger counts in most airports continue to rise, as aircraft with larger capacities are introduced and turnaround times are reduced. Passengers themselves also present a more challenging population during an emergency evacuation than occupants of a typical building. A study was performed to characterise passengers in a large international airport in the U.S. during peak holiday travel periods7. The study found that airport passengers as a group contain higher numbers of wheelchair bound or mobility impaired occupants than a typical building. Many passengers utilise rolling luggage that changes both their footprint in a crowded condition; their travel speed; and their flow through doorways and other exit components. In an emergency evacuation the vast majority of passengers with rolling luggage take their luggage with them when they evacuate, as is evidenced by videos and pictures documenting airport evacuations. Finally, the prevalence of family groups in airports versus typical buildings impacts passenger behaviour in evacuations, as families will first find one another before proceeding to exit, which can have an impact on queuing behaviour. Fortunately, while the modern airport environment presents many new challenges with regard to emergency evacuation, technology has also improved the way emergency evacuations are facilitated in airports. Many airports now have sophisticated command centres in which a variety of sensors, surveillance devices, and other data streams are monitored. Often the airport’s fire alarm, security, and other systems are integrated into an overall mass notification system that is capable of notifying passengers of an emergency event. A state-of-the-art mass notification system also has the capability of displaying messages over the departures/arrivals, baggage, and other display screens to broadcast a message visually throughout the airport. The airport’s PA system is then used to broadcast either pre-recorded messages or real-time messages to instruct passengers to actions to be taken during an emergency event. Advances in speaker technology and audio measuring technology ensure that not only is the audible message loud enough to be heard over ambient crowd noise, but that it is also intelligible, so that the spoken words can be clearly understood. For international airports, messages are often broadcast in multiple languages. One drawback to a current state-of-the-art mass notification system is that the system predominately tells the passengers to evacuate, but then relies upon the decades-old conventional system of exit signage to guide them to the exits. This assumes that all exits can be used safely, which may not always be a valid assumption. Simply stated, passengers are told to leave the building… without being told the best way to go. Dynamic exit signage refers to exit signage that changes state during an emergency event. The simplest dynamic signs flash some portion of the sign in order to draw attention to the sign and increase the attractiveness of the exit. More complicated dynamic signage can change the direction of movement indicated on the sign, depending on the emergency event, or can identify the path of travel via some form of running light. It can also identify those exit paths that should not be used as they may lead to an area of greater hazard. The concept of dynamic signage has been evaluated over many years. An early study conducted by Tadahisa Jin8, one of the leading researchers on the concept of emergency evacuation in fire events, looked at improving the conspicuousness of a sign by flashing the light source and also evaluated an escape guidance system by travelling flashing light sources (flashing a row of lights in the intended direction of exit travel). Both the flashing signs and the traveling light sources were found to improve the attractiveness of the exits. Other researchers have followed on with this work to demonstrate the positive impact of dynamic signage on exiting. From 2001 to 2010 the U.S. Department of Defense sponsored the Pentagon Shield project, which investigated a suite of building protection systems aimed at protecting the Pentagon building from terrorist attacks. One of the components designed to be part of this system was a dynamic signage system that was linked to a real-time building evacuation model that could calculate a routing solution that optimised exit routes to lead building occupants away from an event in the building. 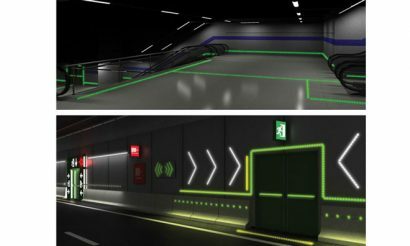 In recent years manufacturers have developed dynamic exit signage solutions that have been deployed on a limited basis in mass transit stations, roadways and rail tunnels, as well as cruise ships. Dynamic signage solutions tend to be of two types – fixed signs and running lights. Fixed signs utilise exit signs that are most often similar to the traditional exit sign, but have the capability to flash a directional arrow or chevron in the intended direction of travel. These signs also have the capability of indicating that the exit should not be used, often by use of a red ‘X’ either through the sign or adjacent to the sign. Running lights can take the form of an LED lighting strip where lights flash in a travelling pattern. Other solutions utilise a series of wall-mounted or ceiling mounted arrows or tiles that flash in a recognisable pattern. In 2013 a series of full-scale trials of a dynamic emergency wayfinding signage system were performed at the Sant Cugat railway station in Barcelona, Spain. The trials were performed as part of the GETAWAY project, funded under the European Union Framework 7 Transport initiative. Project GETAWAY9,10 was later awarded the prestigious Research Impact Award for 2014 as part of the Guardian newspaper’s University Award. The results of this project have important implications on the use of this technology for airports, as the project demonstrated the efficacy of the technology in a blind study of passengers of a mass transit facility. In blind trials participants exiting from a train at the rail station were directed to use specific exits and discouraged from using other exits using dynamic signage. In a baseline trial using standard exit signage, 99% of the 139 participants exited the station using the nearest of three available exits. In a second trial, participants were directed to use only one of the available exits by illuminating a red ‘X’ through the exit sign at the non-usable exits and directing participants to use the targeted exit. In the blind trial 63% of the participants used the indicated exit. 76% of the remaining participants who did not use the indicated exit understood the signage but used the ‘blocked’ exit because they perceived they were not offered a viable alternative, indicating that to be effective, it is necessary not only to receive negative information pertaining to one exit but to simultaneously receive positive information as to the available alternatives. Greater than 90% of the participants reported in post-trial interviews that they understood the signage, despite being previously unaware of the signage convention to be used. The dynamic (flashing) nature of the signs was also reported to have been beneficial to most occupants in readily identifying the location of the exits. Frankfurt Airport in Germany has implemented a comprehensive passenger flow management solution that combines data gathering of real-time information, forecasting, and simulation11. Similarly to the Pentagon Shield programme, the distribution of passengers within and between terminal buildings is forecasted using predictive models that determine routing solutions for passengers making connections that reduce congestion. Real-time routing of passenger circulation is then accomplished by dynamically altering overhead signage in the concourses and at transfer locations. Internal surveys conducted by the airport’s operator, Fraport, suggests a marked improvement in terms of waiting times and passenger satisfaction with the transfer process. While not specifically designed for emergency evacuation, it is conceivable that emergency exit signage could be incorporated into this system to facilitate evacuation during an emergency event. In the not too distant future, one can envision more airports being equipped with dynamic signage solutions for use in passenger wayfinding during emergency events. Several manufacturers are working on dynamic signage systems and partnering with large commercial lighting suppliers to bring these projects to market, not only for airports but for many types of commercial buildings. One manufacturer has reported installation of their technology for an existing system at the Arlanda Airport in Sweden. 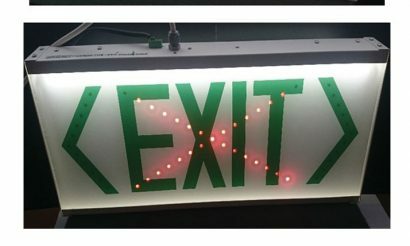 Simple signage systems that flash ‘EXIT’ or ‘Running Man’ type signs in a manner as to indicate the intended direction of exit travel, or path lighting leading to the available system of exits in the building. Dynamic signage systems that alter the direction of indicated travel in a fixed manner depending on the nature of the emergency event. A library of routing solutions would likely be developed during design using passenger evacuation modelling to inform the routing solutions and to identify routing solutions that minimise congestion and queuing during exiting. For this type of system, an operator work station may be provided in the airport’s command centre to allow airport staff to change the routing solution to respond to the changing nature of an event based on new information communicated by emergency responders. 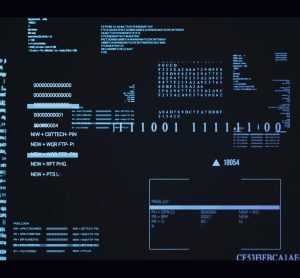 Real-time dynamic signage systems that incorporate a computer model that continues to run simulations based on changing conditions and alter routing solutions automatically as the event changes using an imbedded routing algorithm. These types of systems would likely require the ability to manually override the automatic routing solution should airport staff deem this necessary, based on the changing event. 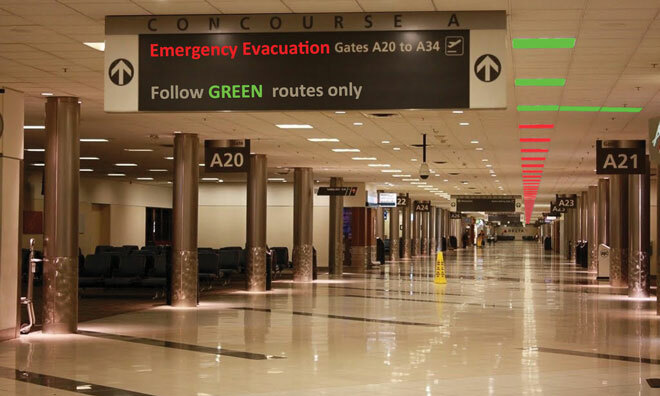 A properly designed dynamic emergency evacuation signage system has the potential to be a game changer when it comes to facilitating orderly evacuation of airport passengers during an emergency event. 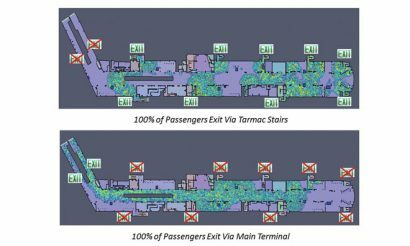 With the advance in lighting technology and predictive emergency evacuation models, lighting solutions can be developed that will keep passengers from evacuating toward an area of greater hazard. It is time to rethink the standard of care with regard to emergency evacuation from airports and consider dynamic emergency signage solutions. 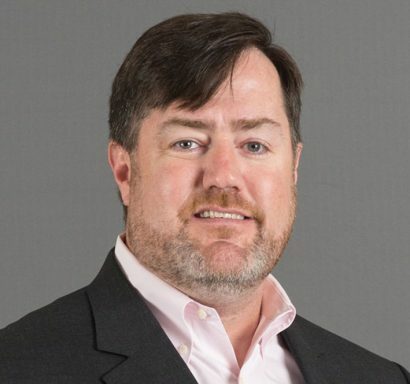 Michael Ferreira is the Vice President Development for Aviation & Transportation at Jensen Hughes, an international fire protection, life safety, and security consulting firm. He is a licensed fire protection engineer with over 20 years of experience performing fire and smoke hazard and evacuation modelling for airports. Felkel, R. and Klann, D., 2012. “Comprehensive Passenger Flow Management at Frankfurt Airport.” Airport Management, Vol. 6t, No. 2, pp. 107-124. January-March 2012. 1)-Établir le dossier des urgences médicales avant toute chose.lorsqu’il y a un accident d’avion,il faut poser les questions suivantes: Quel est le pourcentage des passagers brûlés,en cas d’accident? Quel est le pourcentage des pax atteints de traumatismes crâniens? Quel est le pourcentage des autres lésions qui peuvent être relevés par le coordonnateur médical ou les médecins traitants? 6)- Dans toute gestion de crise: 08 minutes est le temps maximum pour intervenir et sauver des vies humaines.Au-delà,de ces 8 minutes…. la prière de l’absent est nécessaire( pour les Musulmans).